This page is created to assist parents in determining whether their son/daughter is eligible for a RACE accommodation for the state examinations. Please read the information here and if you think that your son/daughter should make an application, then please contact either the Guidance or Special Needs Departments in the school for further information. This includes information regarding special arrangements in the state examinations for candidates with learning, visual, hearing and/or physical difficulties. Students who received accommodation at Junior Cert may have their accommodation reactivated for Leaving Cert if there is no change in circumstances with the exception of special centres, subject to confirmation by school authority of an identified and continuing need. The school will work with these students initially in terms of the reactivation of their application. 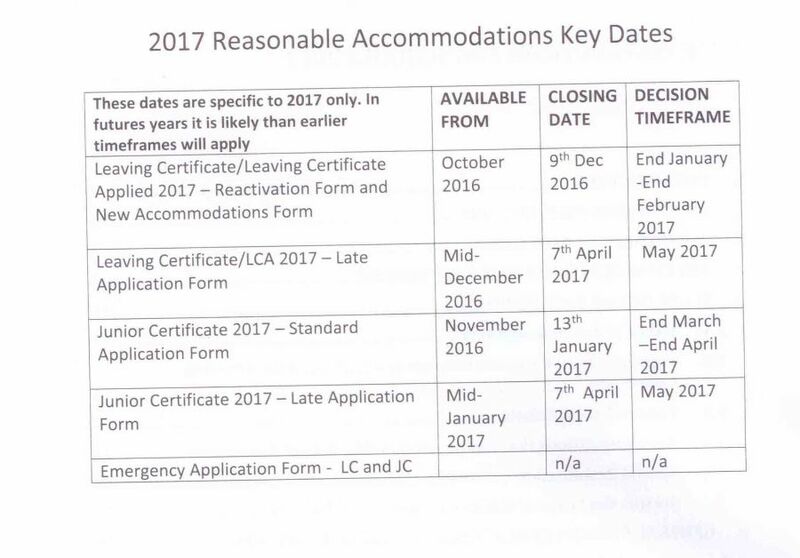 Students who did not have accommodation for their Junior Cert but may be eligible at Leaving Cert will also be considered. For the purpose of identifying eligibility, the school is obliged to follow the criteria as outlined by the State Examinations Commission. 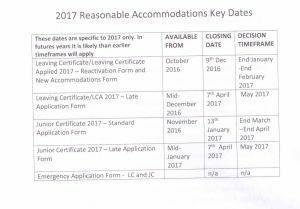 For 2017 the eligibility criteria for accommodations has changed. Initially all potential eligible students have to undergo school based assessments. This process will begin in early November 2016. Parents of potential eligible students will be notified in writing and asked to give their consent to allow this process to begin. However if you believe your child should be given consideration and has not received a consent form, please contact the school directly. Please review the key dates outlined below. All deadlines will be strictly applied by State Examination Commission.